There is nothing like the timely and appropriate use of arnica to remind one of the power of homeopathy. Used for centuries by Native Americans and early settlers in Europe, arnica has most commonly been used for treating wounds, bruising and inflammation. 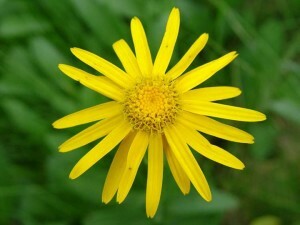 But the list of benefits from arnica is much, much longer than bruising and inflammation. It is useful for a speedy recovery after surgery, overusing muscles in an intense workout, a sprained extremity, pain from childbirth and head injury as well as many other things. Taking a homeopathic dilution of arnica may help ease muscle soreness, according to a 2003 study of 82 marathon runners. In a 2002 study of 79 adults with mild to moderate osteoarthritis of the knee, researchers observed a significant decrease in pain and stiffness—as well as an improvement in function—among those who used arnica gel twice daily for six weeks. Another study, published in 2007 and involving 204 people with osteoarthritis of the hand, showed that arnica gel lessened pain and improved hand function as effectively as ibuprofen. Taking a homeopathic dilution of arnica may slightly reduce postoperative swelling, according to a 2006 study of 227 adults undergoing arthroscopy. And arnica can assist greatly after surgery to reduce pain and swelling. In a 2007 study of 190 adults having their tonsils removed, scientists discovered that those taking a homeopathic dilution of arnica had a small but significant decrease in pain compared to patients assigned to a placebo. Finally, a 2002 study of 37 people undergoing surgery for carpal tunnel syndrome found that taking a homeopathic dilution of arnica and applying arnica ointment also produced a significant decrease in post-surgery pain. In my practice I have seen first hand the benefit of arnica after surgery. A client of mine underwent a hip replacement and took a high-potency homeopathic dilution of arnica. She had received pain medication only in IV during surgery. Several hours after the surgery, with no more pain medication requested, her nurse was astonished to find that she didn’t need anything for the pain because she had none! There is no study on the effects of arnica for trauma after birth nor can I find one on the benefits of arnica on head injury. An Indian colleague is suggesting a scientific study of the effect of arnica on head injuries and states that he “treated more than 20 patients of various types of trauma with varying component of brain injury with arnica Montana… Some patients under went surgical management. Irrespective of the primary management, the result appeared to be better than my previous experience. This may contain significant element of bias which justifies the need for a randomized blinded study with specific objectives in mind such as end-point recovery time, relative difference in peri-lesional edema and other physiological end points.” My own observation has been that clients with terrible incessant headaches from a head trauma from a car accident have had their headaches greatly reduced or completely eradicated by arnica. Arnica is always my first defense after an injury especially when the cause is a blunt trauma and indications are bruising, worse from touch and better by cold application. This is truly a wonderful and inexpensive resource every family should have in their medicine cabinet!